A good morning in Kununurra starts really early. That’s because this town in the East Kimberley is just west of the Northern Territory border and the Central Australia time zone. Crossing the border into Western Australia means you gain 1½ hours so what was 7:30 am in the Northern Territory is now 6:00 am! And the sun is well and truly up by then. BUT … there’s no point fighting it because instead of setting around 6:30 pm, the sun disappears at 5:00 pm. So rising at the crack of dawn is just a smart way of using all available daylight hours. Or so they say! We tested out the theory with magical sunrise visit to the small but impressive rock formations of Mirima National Park, only a few kilometres from our campsite on Lily Lagoon. And darned if it didn’t start our Kununurra morning perfectly! 1. There was no one else around! Well … apart from the two manic joggers busy filming themselves running for Facebook. If you’re one of the ‘lucky’ ones to have seen the footage, it’s my sad duty to inform you that it’s SO not spontaneous! 2. The light was perfect for photography. TOO perfect. Maybe it’s time to accept that not EVERY photo I take is an oil painting, and start culling before my SD card fills up. Again. 3. There was a lot more wildlife about. Sandstone shrike-thrush, Kestrel, White-quilled rock pigeon. 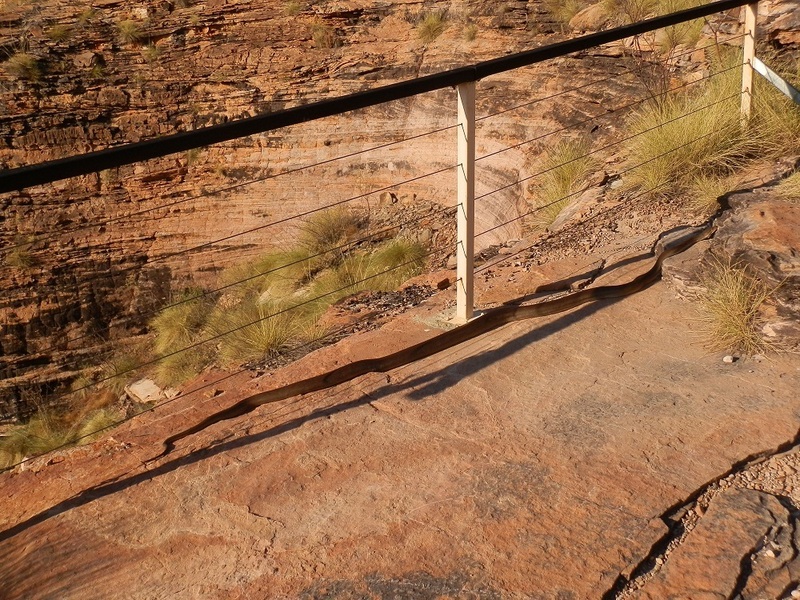 Oh, and what’s that snake-shaped shadow along the look-out ledge? That would be a three metre snake, of course! 5. And the smug, superior, self-righteous glow you’ll wear after such a sublime start to the morning lasts all day! Trust me! « Signs #20 – Croc? OR CROCK!! @Luvting – It’s the dry season! It would look completely different in the wet season, but it’d also be WAY hotter! @JJ – Thank you – I think!! I look forward to the challenge, poisoned chalice though it is!! @Jo – Thank you! Wasn’t sure if I had to be named and shamed somewhere to participate!! @Indrani – Luckily, it was too cold for him to move fast!! Lovely scenic sights, but the snake is scary. I’m nominating you, Red. Check out the Capture The Colour entry guidelines and Good Luck. Have tagged you in my post! @MJWC – Haha, me too! Pilchard had to convince me it was too cold for the snake to move!!! @diane b – YES! Now I know what all the fuss is about!! Can’t wait to visit some of the places in your photos!!! @TMWH – Boy, are you going to regret that statement when you see my next photographic installment! @Flea – Well, keep watching this space and I’ll give you more sunshine than you know what to do with! @Journey Jottings – Haha, thank you VERY much for those nasty seeds of doubt!! But it’s a win-win: if it was a python, I’ve got some great python shots – but if it WASN’T a python, how brave am I?!?! @Cloudy – Thank you! You’re too kind … but I’m glad you enjoyed it! @Jo – Thanx … but have I been nominated? Would love to enter, but don’t see my name anywhere!!! @Go Camping – Thank you!! Camera is an Olympus SZ-10 I got for Xmas! Loving it to death!!! @Travel club – Thank you!! Feel free to promote me to your members, won’t you?!?! @Andrew – Having the Ord River Irrigation scheme AND OZ’s largest lake in close proximity helps!! @ladyfi – Thank you! It was spectacular!! @Wendy – Well … there’s a good reason to stay away from Texas! At least MY snake wasn’t venemous!! @SFlaGuy – OMIGOD!!! Those cunning rascals!!! I KNEW there was a reason I’d seen so many more snakes in recent years!!! @Saucy Kod – Lily Lagoon is part of a larger lake/dam system for irrigation. But it sounds similar to your lake – so nice to visit, huh?! @Frankie G – Haha, are you SURE the cracks weren’t snakes??!! We did the spotlight thing on the lake and yep, the red eyes are still there!!! @River – This whole region is MAGIC! Definitely put it on your retirement list – lots of bus, boat and plane tours up here, fabulous food and magnificent scenery! That is one impressive snake! I would have gone into cardiac arrest at the sight of it. Once again, some gorgeous photos. What sort of camera are you using? Beautiful spot — lovely photos. E-mail a mango or two to me, will ya? And a one and a half hour time zone change is weird! I have enough trouble with an hour at a time when we travel. I have trouble keeping up w/ my fav blogs whenever we’re on a roadtrip, so I understand perfectly. Don’t worry about reading blogs for now. Just concentrate on getting some more gorgeous pictures. Hopefully, minus any more pythons! That is one long snake. So you are in the Kimberleys at last. Isn’t it the most beautiful place !!!. You’ll get lots of RED there. Oh No!! Don’t like snakes. I do a dance when I see one. I also almost pee my pants. Great Pictures!! Even of the ugly snake. These pictures made me want to dive into my screen and join you. It’s a beautiful area. I love the snake, I was amazed at how long he is, I haven’t seen one that long outside of a zoo. Gee, Red, I really love the ?rock croppings and levels. These are swell. I am intrigued with Lily Lagoon. We have such a lake here, which is called Lily Lake, not too, too far from home. You can paddle boat, walk trails, canoe, row, swim n play, cook your own BBQ or lunch. Great place. When I first saw the “snake”, I thought at quick glance, it was just a crack in the ground and then, of course read on – YIKES – u can have ur snakes girlie and the closeup is Kool. Now Mango Smoothie I could go for and what a great start to my day to have one of these too. YUMMY. Great photos and just luv the Rock Formations. Another stunning photo essay. I met The Gator Boys here in South Florida a while back. They have a TV show here in the states that centers around clearing critters like alligators and pythons from peoples yards and pools. I have been wondering what they have been doing with all those giant snakes and lizards. I think maybe you gave us all a clue. Dang the snakes there are just as big as the snakes here in Texas, Wow!! I’ve never seen a python like that either, lol…Beautiful countryside, thanks for sharing!! I’d gladly put up with passing by a snake if cheesecake was on offer afterwards! If one must travel to hot and dry areas, Kununurra doesn’t look half bad.